2017 is now officially here and my race season has started! First race up is the 30th running of the CRCRC Midwest Championships in Jeffersonville, OH. 2017 would be my 10th year attending and it is one of my more successful race events. I would fly in on Tuesday evening and get ready for Wednesday and Thursday practice. The track is one of the bigger tracks we go to each year for 1/10 and the layout looked really fast and fun. I had also made the switch from Proline back to AKA for 2017, so I was looking forward to getting back with the brand that supported me for 7 years before 2016. Wednesday would be open practice and I was running all 4 Modified classes, Mod 2wd, Mod 4wd, Mod Truck, and Mod SCT. Coming into this event I was very confident with all my setups and practice went really smooth, with all my cars driving great. 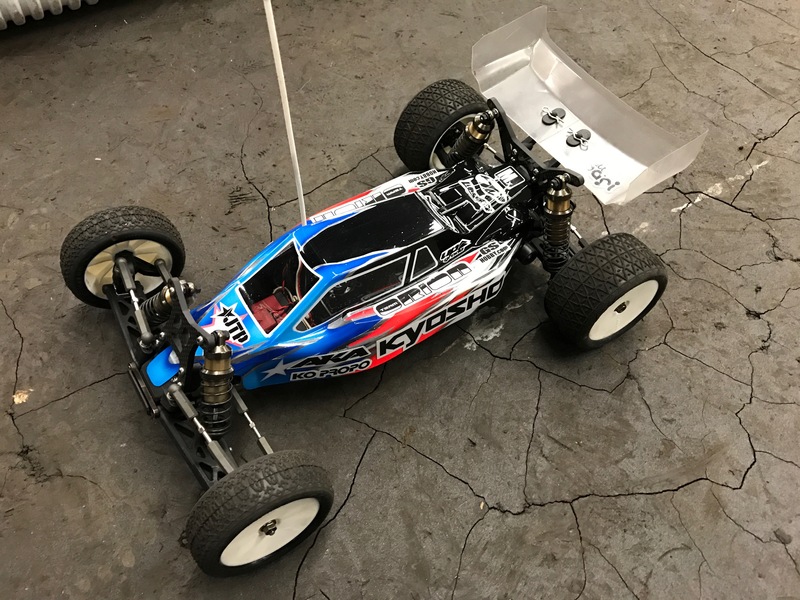 I did debut some new, soon to be released, JTP parts on my Kyosho RT6 and SC6, so I worked on those setups some, but my trucks were driving great. Thursday would be a half day of open practice and then one round of seeding practice, with 5 minutes runs and taking your best 3 consecutive laps to seed you into your qualifiers. With the big track and high speeds, open practice was pretty wild with all the different car speeds and driving ability on the track at the same time. I always look forward to seeding because then you can finally get a true feel of your pace and your competition’s pace. I had good seeding runs in all my classes, seeding 1st in Mod 4wd and Mod Truck, and then 3rd in Mod 2wd and 4th in Mod SCT. Planning no changes going into qualifying, my main focus was just making sure I had good sets of tires and my tire prep was consistent. Friday was here and it was race time in 2017, bring it on! Mod 2wd was up first and I was feeling confident. 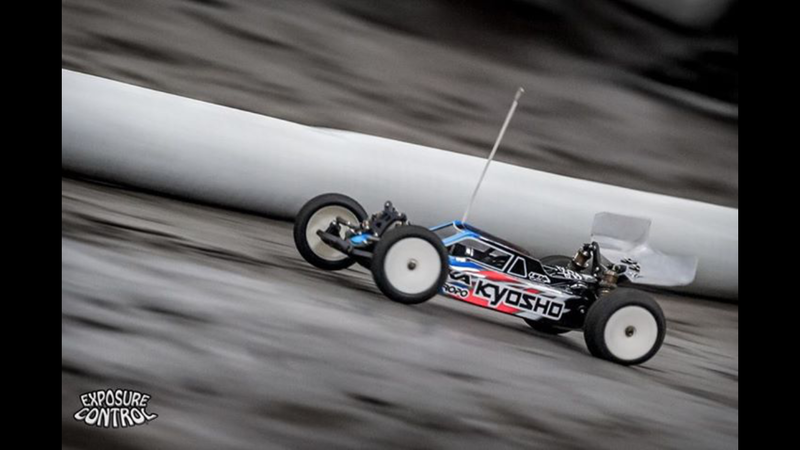 My Kyosho RB6.6 felt perfect and I was just driving my own race. I had a really clean run and took a pretty easy TQ, starting out the day awesome! Mod Truck was next and the run was very similar to 2wd, except at the end. 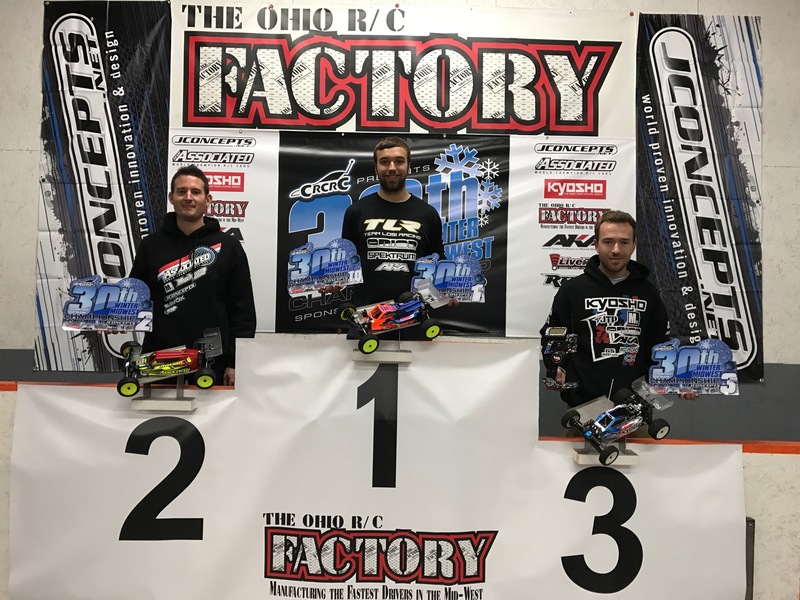 My Kyosho RT6 was driving great and I had a good lead, but had some misfortune at the end, loosing some time and battling for the TQ on the final lap. I made a last lap mistake on my own and lost the TQ. Mod SCT I was still getting used to racing it after not racing that class at all in 2016. 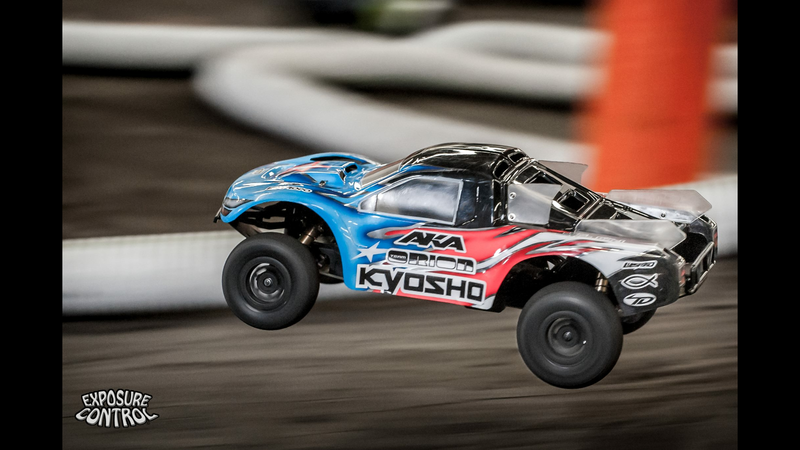 I had a good run to get 2nd, but I was still a little off the pace and my Kyosho SC6 was feeling hard to drive fast. The last class would be Mod 4wd. 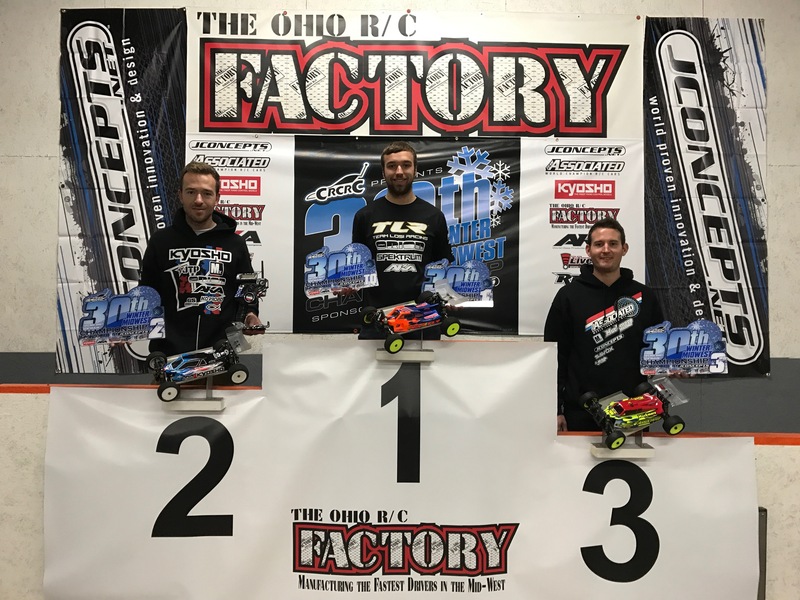 I had the top seed and felt very fast, so I was expecting a TQ. Started out super fast and lead the first lap, but then on the second lap, a slower car crashed right in front of me, and I got tangled. After the crash I had to double the big back triple and lost more time, but I never gave up and charged to finish 3rd. Q2 I was feeling confident and ready to get some more TQ runs. 2wd was again really good and this time me and Phend would battle for the TQ with it going down to the last few laps. I had a little bit of a cushion but I was catching traffic and would have to deal with it during my last two laps. I got through it okay, but I would slow down and lose by just .146 of a second short and get a 2nd. Truck I would get things back together and put a clean run in. 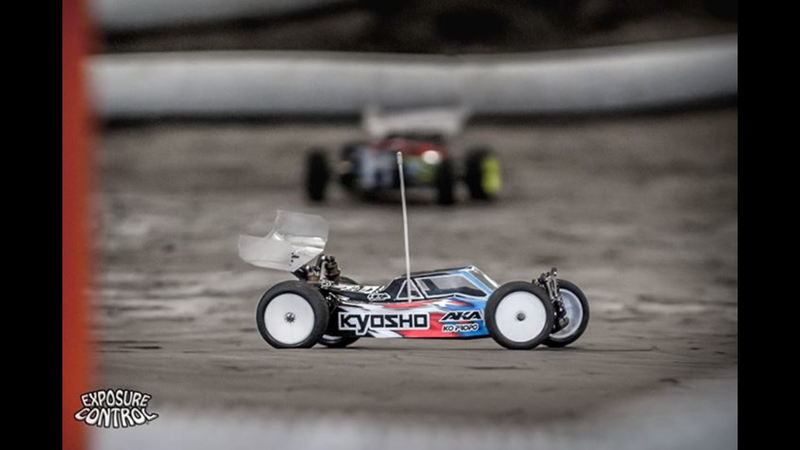 My Kyosho RT6 with new JTP Carbon Towers was working amazing, and I took the TQ by over 5 seconds over Cavalieri. SCT I made a few changes to my truck to get some more roll and try to get the truck to drive a little easier. I would have an okay run, but still not have great pace, getting a 3rd. 4wd I would also make a change. Running 3K/500K/5K diffs, I changed to 5K/500K/7K and my feeling was not good at all. I lost my corner speed and lost my good feeling I had on corner exit, and I wasn’t as fast a Q1. I made some bobbles an ended up 3rd. Saturday would be the final day of qualifying with Q3 and Q4. 2wd as up and I wanted another TQ after being so close in Q2. I would have a good start and really good feeling with my Kyosho car and AKA tires, and again it would seem to be me and Phend battling. This time I was a little bit behind and putting in a charge at the end. 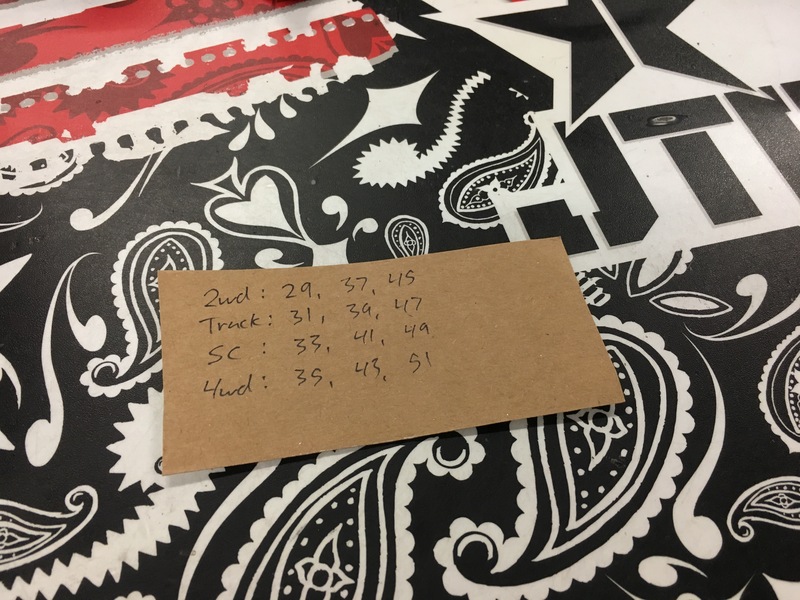 I would do my fastest lap on my last lap and almost get the TQ, Phend finishing with 15 laps in 5:06.595 and I ended with 15 laps in 5:06.598, missing it by .003 of a second. Truck I would continue my momentum from Friday and get another TQ. SCT I would again make more gains in speed, but again get a 3rd. 4wd I put my diff setup back to how I had in practice and Q1, so I was feeling more confident. I drove a great qualifier and was putting down my fastest laps I’ve done all weekend. I kept clean the whole run and took the TQ by 5 seconds over Phend. Q4 was finally here and I had a chance to TQ 3 of my 4 classes. 2wd and 4wd I would have to TQ and set some fast times to try to win in the tie breaker. Truck I just needed to TQ to secure it, and if Cavalieri took the TQ, he would have to have an amazing time to beat me in the tie breaker. 2wd was up and I decided to run brand new AKA tires to have another good set for the mains. My car felt surprisingly good and fast right away. Phend, Cavalieri, and myself were all battling pretty hard, but then it was just me and Phend fighting for the lead. We were both pushing the pace really hard and wanted the TQ, and we both started to make some mistakes and swap the lead back and forth. I would make more bobbles and finish 2nd, 2 seconds behind Phend. Truck I needed the TQ, but this would be the closest battle we would have. Cavalieri was getting his truck a little better each run and running a little closer to me in each round. This round we would stay pretty close and push the pace pretty hard, but I held on and took the TQ by 2 seconds and locked up the overall. SCT I would have my best run also and be the closest to on pace in all of qualifying, but 3rd was still my best. 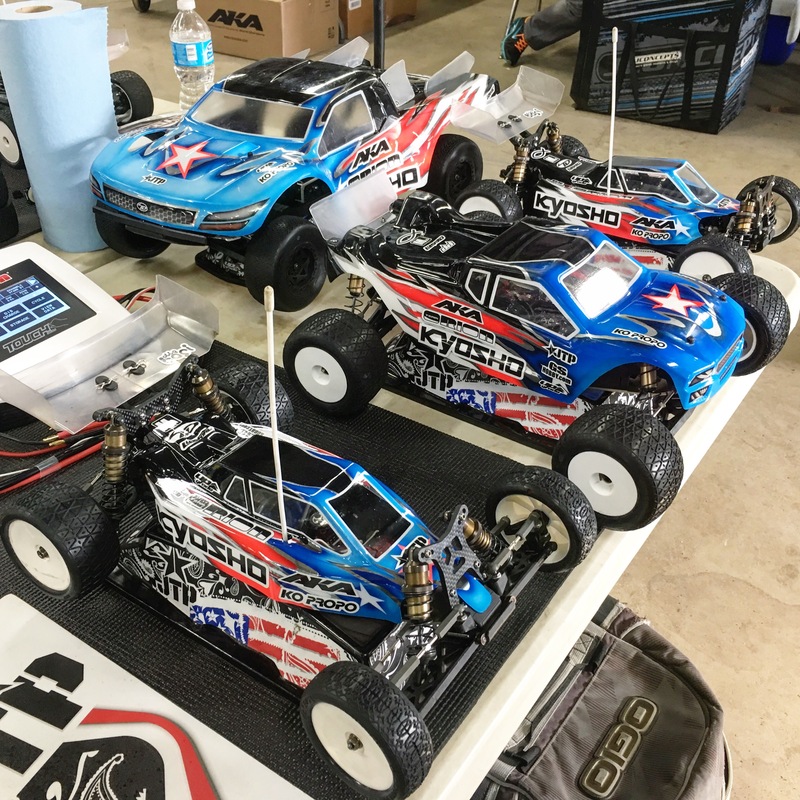 4wd was my last shot at getting another TQ. I needed to TQ and do a 16 lap 5:13 or better to secure it. I started out pretty strong and was leading the heat early, trying to put down my fastest laps. 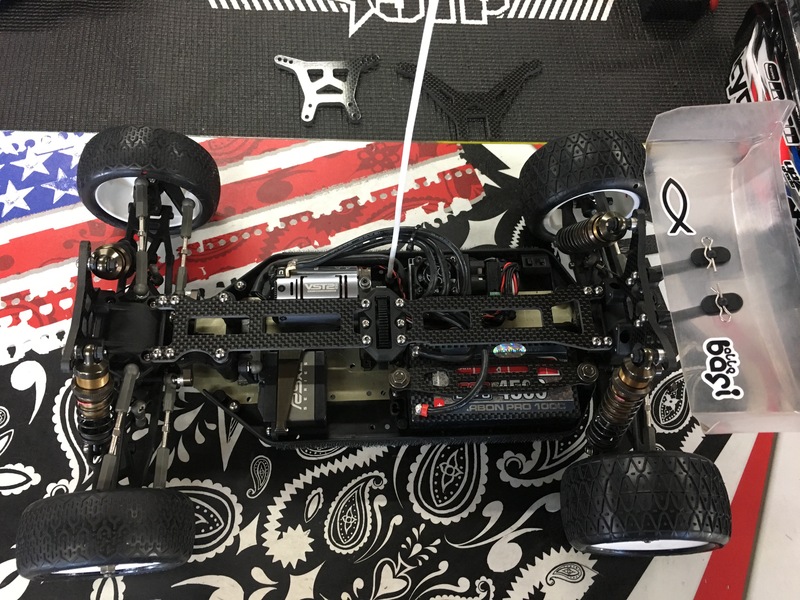 My Kyosho ZX6.6 with new JTP Carbon Top Decks was feeling amazing and I was charging as hard as possible. I had a 5 second lead and was looking to be on pace to get the time I needed, but I made two bobbles in my last few laps and it cost me. I got the TQ, but I finished with a 16 lap 5:14.498 and that was not enough to get the tie breaker. 2wd : A1 I would get a great start and benefit from Phend making an early mistake. I got into the lead and pulled a lead right away, just doing my own thing throughout the race. Starting the final lap, I had 3.5 second lead and the race was mine, but then disaster struck. Coming off the straight, only 2 corners to go, a car would crash into the inside pipe; I saw it and moved my line to miss it. Then the turn marshal ran out and clipped m car with his feet, crashing me. I would get going and still be i the lead, but a car that I just lapped passed me. There was a jump going too slow and I had no space to go anywhere. I ran into the back and we got stuck, giving Phend a HUGE gift and the A1 win. I was completely disheartened and just couldn’t believe what had just happened. That seemed to kinda set the tone for the rest of the day unfortunately. A2 I knew I had to win and I had to fully put what happened earlier out of my head. I was ready to battle hard! I had a great start and was all over Phend, looking to pass anywhere I could. A few minutes in he went wide after the super fast center table to double, I took the inside and took the lead. I only held it for a few turns as I brushed a pipe in the chicane and gave the lead right back. I stayed glued to Phend’s car for the rest of the main and was feeling faster, just couldn’t get by. Getting read to cross the finish line to get two more laps, in a section I was able to hold a much righter line than Phend, a car had crashed. I didn’t see it as it was a dark car and I drove right into it, taking away any chance to win and dropping me back to 3rd. Not happy at all, I wanted to win A3 and take 2nd overall. I got a good start and the battle was on between me and Cavalieri. Both our paces were very similar and we were just flying around the track. A little after halfway, Cavalieri ran in pretty hard before the back triple and just barely clipped my wing, making me jump wide and getting off line. Cavalieri made the pass and I was charging to get it back. I got right on the back and finished .2 behind him, and that took 2nd overall away from me. I was extremely disappointed to have such a great handling car and to have driven great, feeling I could have taken the win, but actually getting 3rd. Truck : After the disaster I had in A1 of 2wd, I wanted to get a good truck and forget about what had happened. I knew my pace was fast enough to win, I just needed to do my thing and drive my own race. I got a great start to inch away slowly, but Cavalieri was keeping me in sight. Around halfway I was feeling great, but made a little mistake, clipping the chicane and giving up the lead. I put in a charge and got back to Cavalieri and was looking for a way by. 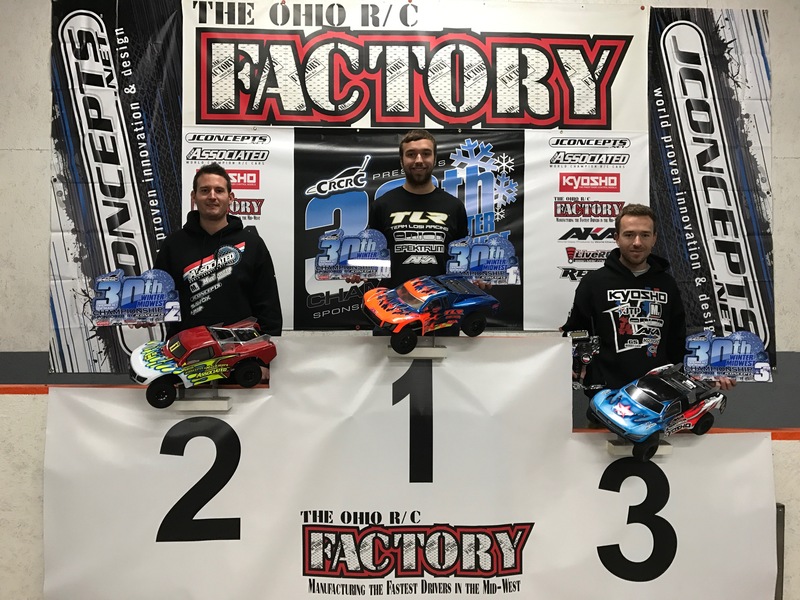 We battled hard until the final 30 seconds, Cavalieri jumped a little wide on the triple, I thought I was going to get my shot, but then clipped a pipe while we almost went side by side and I crashed. I would finish 2nd. A2 I was in a MUST win situation as I had just lost out my chance to win in 2wd. I got a good start and finally just drove my own race, not making any mistakes and taking an easy win by over 9 seconds on Cavalieri. A3 would be a really intense battle as I needed the win to take the overall. I would get a great start and drove really smooth, pulling out a one second to 1.5 second lead for most of the race. With 1.5 minutes to go, 3 trucks would crash in front of me after the back triple and I would get tangled with one of them, thankfully I held the lead, but now Cavalieri was right on the back of me. We would battle to the end and I would take the win by .5 of a second and take the overall win! 2wd SCT : A1 would be a very exciting race to the end. Phend would make an early mistake and Cavalieri and I would both go by. Me and Phend would make little mistakes and go back and forth a few times, losing time to Cavalieri. Towards the end though, Cavalieri would bobble and we would all bunch up and battle on the very last lap. It was so close the final few turns, I thought I was going to be in the best position as I was 3rd, thinking the top two might crash. Cavalieri won, Phend would be .2 back and I was only .1 back from Phend. A2 wasn’t near as exciting for me as I struggled some with mistakes. I would not have a great race and would finish 4th, with Phend just barely beating Cavalier to send it to A3. I had no shot at the overall, but I needed a good finish to make sure I was 3rd on the podium. Phend would crash on lap 1 and give the lead to Cavalieri and I would be in 2nd. I would try my best to stay close to the lead, but I still didn’t have quite the pace needed to battle for the win very easily. A couple minutes in Cavalieri would crash and hand me the lead. I really wanted to end SCT with a win, so I tried to drive as smooth as possible and make Cavalieri have to pass me. He was all over me and then I bobbled with 1.5 minutes to go, and then I would bobble again and give 2nd to Phend. That very next lap, Cavalieri would go really wide at the end of the straight and both Phend and I would by by. While I was on the side after the straight, Cavalieri would be trying to get back into the racing line and we would make some contact over a jump, He wasn’t very happy about it, but I was just driving my own race and trying to finish the best I could. We would battle really really hard to the finish, and I would barely hold off Cavalieri to finish 2nd, giving me 3rd overall. 4WD : A1 had a good start and was trying to stay as close to Phend as possible. Cavalieri had an issue and was off the track, so it was just us two up front. I stayed pretty close the whole race, but wasn’t able to get close enough, and also had a crash on my last lap, but I held onto 2nd. A2 I needed a win to keep the overall a possibility. I had a great start and was feeling really good, Phend was slowly catching, only a tenth a lap or so, I had1.5 second lead with 30 seconds to go. I hit the back triple and jumped a little sideways, landed it and went into the chicane, my left wheel moved weird and then noticed my camber was way off and my left rear drive shaft popped out. I limped around to still finish 2nd, but the overall was gone. I was really frustrated after that one with losing out in 2wd right at the end as well. A3 I needed to win to take 2nd overall. After the hard battle and some not too nice words between myself and Cavalieri, I knew it would be a very intense race. I had a great start and tried to pull away, but Cavalieri stayed right there. The pace we were pushing was pretty intense as we were just flying around the track. I started to pull a small gap, around 1 second, but then around halfway, I jumped wide off the triple and barely saved it. Cavalieri was right on me and the battle was on. With a minute to go, I would clip the chicane and give up the lead. I would then catch back up to the back of Cavalieri and he would go wide coming onto the straight and I would pass him back right before the last lap. We would battle hard on the final lap, he would clip my wing before the triple, making me jump wide, he drove inside, we hit and went side by side into the chicane. I had the inside and we hit again, which would spin him around and give me some room to take the A3 win and 2nd overall. 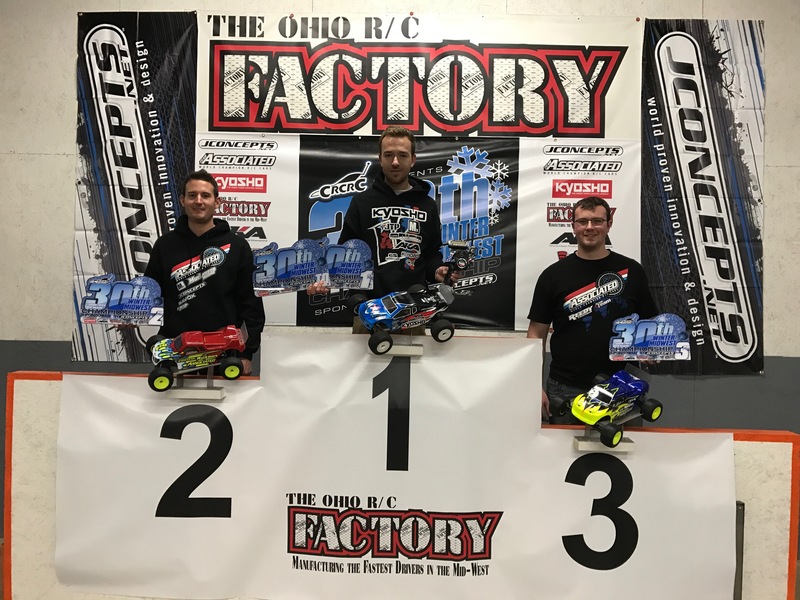 Thanks to all my fans, my family, Joe Pillars, Mark Pavidis, all my great sponsors, Kyosho, AKA, Team Orion, KO Propo, GS Hobby, JTP, Upgrade-RC, TD paint, Lunsford, and the Good Lord Jesus Christ. See you guys at the next race; thanks for reading! God Bless! Always good to hear your race experiences! Happy New Year and may God continue to bless you and your family. Great article written with heart and real emotion. Very valuable information on how to race hard and the situations that arise out of a competitive environment.